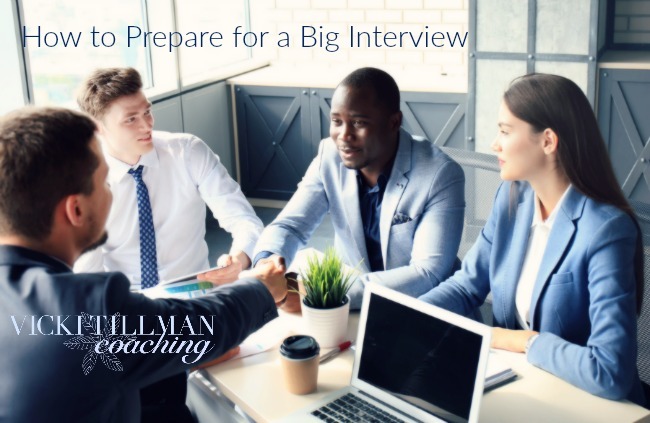 Here is how to prepare for a big interview. Finally got that big interview you’ve been hoping for? You don’t want to mess around with this one! Here’s how to prepare for a big interview. If possible, find out who will interview you and read their Linked in profile(s). Give examples of how you deal with conflict with colleagues/bosses? How have you overcome challenges on your previous job? Tell about a failure you’ve had at work and how you handled it. How do you deal with unexpected events? Give an example of your innovative thinking. Of which accomplishments in your life are you most proud? What have you learned about yourself during your career? Who has mentored you? What made them good mentors? What did you make for supper last night? How many beachballs fit in a minivan? Describe yourself in 2 words. What are some goals you have for new hires? What is a typical day for my job title? What is the training process for this job? What are some challenges the company faces in the next few years? What is the corporate culture here? How soon should I follow up? Contact me for Career Coaching and help for the job search process. You go! You’re going to do a great job at that big interview!